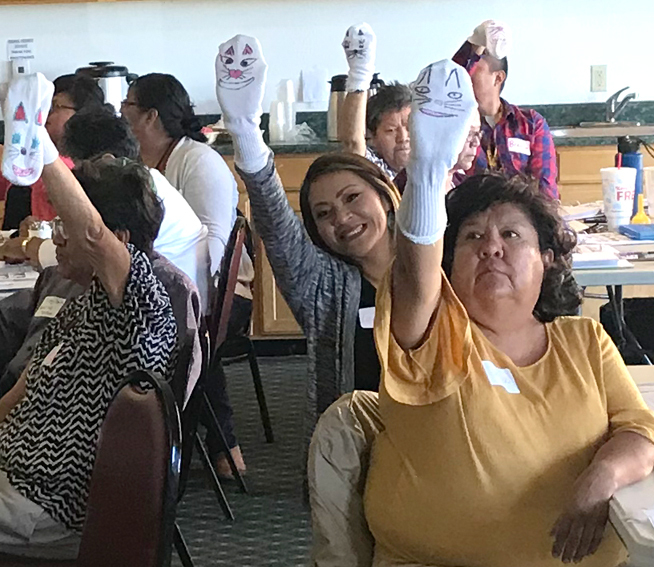 Over the summer, the Early Math Training Network at WestEd had the honor of conducting a hands-on workshop with the Navajo Nation in Window Rock, Arizona. The workshop, “Supporting Children’s Early Mathematical Development at Home,” focused on implementing home activities that simultaneously develop students’ mathematical skills and help parents build communication with their children through meaningful dialogue and interactions. Young children from low-income families tend to receive less support for mathematical development in their home and preschool environments. As a result, many economically disadvantaged children are not ready for mathematics when they enter elementary school. The Early Mathematics Training Network was created to address this disparity by enhancing mathematical development in young children, both in the classroom and at home. In Window Rock, workshop participants learned to create opportunities for children to work closely with their parents, caregivers, siblings, or other family members to solve fun but challenging math problems. Participants were introduced to activities such as “Help Kitty Compare” and “How Many Dinosaurs,” which develop familiarity with numerical comparison, arithmetic, and space and geometry. Workshop attendees also acquired strategies to introduce children to problem solving through scaffolding, and to provide extra challenge when children reached a full understanding of mathematical concepts — all accompanied by step-by-step instructions and other supporting materials to comprehensively facilitate the activities. At the workshop’s conclusion, Navajo Nation staff officially incorporated Early Mathematics Training Network home activities into their existing Family Engagement Program, “I Care Positive Parenting Character Curriculum,” which aims to increase positive interactions between children and their caregivers at home. “What I appreciate most about this training is that you all did not try to change the way we are teaching; instead, you showed us ways we could incorporate what we’ve learned from you to enhance our programs. We definitely appreciate that,” said a school readiness coach who participated in the workshop. WestEd continues to collaborate with the Navajo Nation to increase the efficacy of their childhood programs and services, assisting with curriculum alignment to the Common Core State Standards and the Head Start Framework. Staff are also working closely with the Navajo Nation to translate WestEd materials into the tribe’s native language, Diné. For more information about WestEd’s work with the Navajo Nation, or about how the Early Mathematics Training Network can serve your community, send us a message through our contact form.